QCOM suffered mightily over the past 2 years, as a Chinese anti-trust case emboldened manufacturers there to refuse demands for royalty payments and turn to alternative chip suppliers. This was compounded by the company botching the transition to 64bit smartphone CPUs, opening the door for chipset share loss, notably at Samsung. After its fall from grace, QCOM took steps to reverse the negative course: 1. It cut a deal with China for reasonable standard royalties; 2. It released its proprietary and superior 64bit CPU design; 3. It contracted to build its 2017 SoC on Samsung’s world best 10nm LPP process; and 4. It announced layoffs for 15% of its workforce. These steps have begun to pay off with the big 3QFY16 beat. Chinese OEMs have begun to pay at standard rates, perhaps after forgiveness for a part of their back royalty obligations. QCOM has regained chip market share, and is poised to take more next year with its 10nm SoC. QCOM chip customers in China are also taking market share, perhaps at the expense of AAPL. We believe that these drivers, along with the ongoing QCOM friendly shift of the more than 2.5B 2G GSM mobile subs to 3G and 4G networks, will continue to drive sales and profit growth ahead of estimates going forward. Given this, we believe that the 13x forward P/E multiple (against pessimistic estimates) could rerate to something much closer to the 17.5% market multiple, yielding 30%+ upside from current levels. QCOM shares are off 25%+ over 2 years. 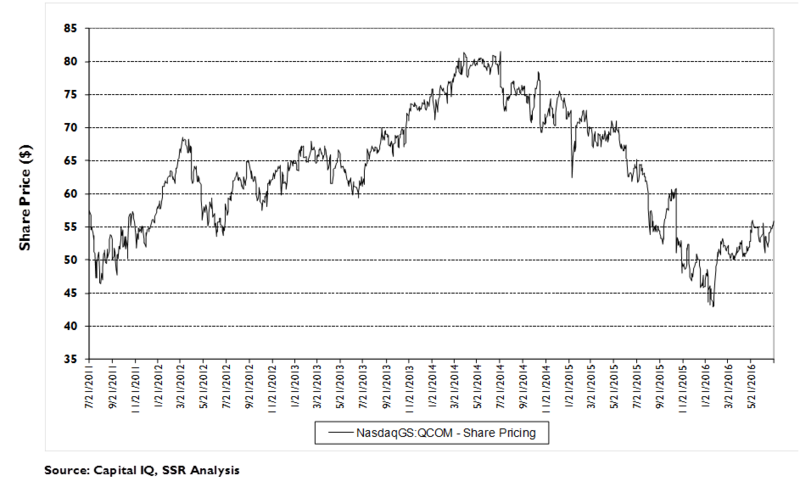 In July 2014, QCOM shares peaked at more than $80 before beginning a precipitous fall to less than $45 in January of this year. This drop was catalyzed by two major factors – an anti-trust investigation launched by the Chinese government, and the failure to complete a proprietary 64bit CPU design in time for the 2015 model year. QCOM was unable to collect royalties from many Chinese OEMs and it lost chipset market share, yielding sharp quarterly disappointments from declining sales and profits. The narrative on QCOM shifted to skepticism for the sustainability of its royalty stream and for the competitiveness of its chip designs. Deal with Chinese regulators recognizes value of QCOM IPR. In February 2015, QCOM agreed on terms for patent licensing on phones to be sold in China by Chinese OEMs. The terms essentially preserve QCOM’s current rates for 3G/4G multimode phones, while offering a 30% discount on 4G single mode phones. Since China is the only major market where single mode will be a significant market, this sets strong precedent for negotiations outside of China, while still locking in reasonable rates in country. The framework also breaks the logjam in licensing negotiations with indigenous manufacturers who had been withholding royalty payments in the interim. QCOM has announced the signing of dozens of new licensing agreements over the past year. New Kyro CPU is the industry performance leader. QCOM’s proprietary 64bit processor, dubbed Kyro, debuted with the Snapdragon 820 SoC delivered at the beginning of the year. 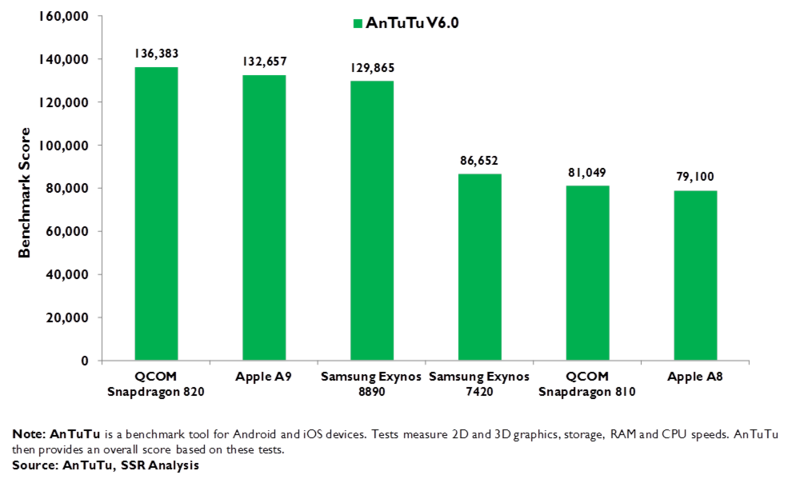 Benchmarks show the 820 with a 70% performance increase vs. 2015’s 810, leapfrogging the latest offerings from Samsung and AAPL, companies that had seen advantage in the prior generation. With the new part, QCOM has won back market share lost in 2015 – of note, Samsung selected the 820 for its flagship Galaxy S7 after booting QCOM for the previous Galaxy S6. Snapdragon 823 poised to raise the bar again. QCOM’s next SoC iteration, believed to be the 823, is rumored to be arriving before year end, perhaps powering Samsung’s coming Galaxy Note 6. This part is being built on Samsung’s brand new 10nm LPP fabrication process, a move that has significant positive implications for its size, performance and power efficiency. Rumors suggest that the quad-core 823 will operate at 2.2GHz, an 18% increase in clock speed that is one of several levers that should boost performance. Time to market has always been an advantage for QCOM and the 823 seems to push this even farther, coming 2-3 months earlier than previous cycles, if the rumors true. Moreover, we expect Kyro to migrate further down in QCOM’s product line, pressuring rising competitors like MediaTek and Spreadstrum. Job cuts helping the bottom line. In July 2015, QCOM announced a 15% force reduction, cutting 4,700 jobs and $1.4B in annual expenses. In 3QFY16, R&D spending was down 310bp or $139M, helping to raise operating margins to 26.3%, recovering more than half the ground lost since 2014. These cuts will have more traction in coming quarters, as improving royalty collections simultaneously raise gross margins. QCOM much better positioned than most think. The skeptical narrative around QCOM overestimates a deterioration in the company’s royalty rates while underestimating its potential to grow its chip business. QCOM holds 12.5% of the seminal patents in 4G, the highest share of any company, and it continues to lead in the development of the upcoming 5G standard. With the structure of its licensing contracts and the importance of precedent in global patent settlements, we expect rates to be relatively resilient. Furthermore, despite a mature premium smartphone market, the shift from 2G to 3G/4G in the developing world is a huge opportunity for both royalties and chipset sales. QCOM is also moving to address more value within wireless devices, and is well positioned against future growth opportunities, like IoT, automotive, and hyperscale data centers. We expect earnings growth over the next few years to average 10% or more annually. Estimates and multiple are too low. 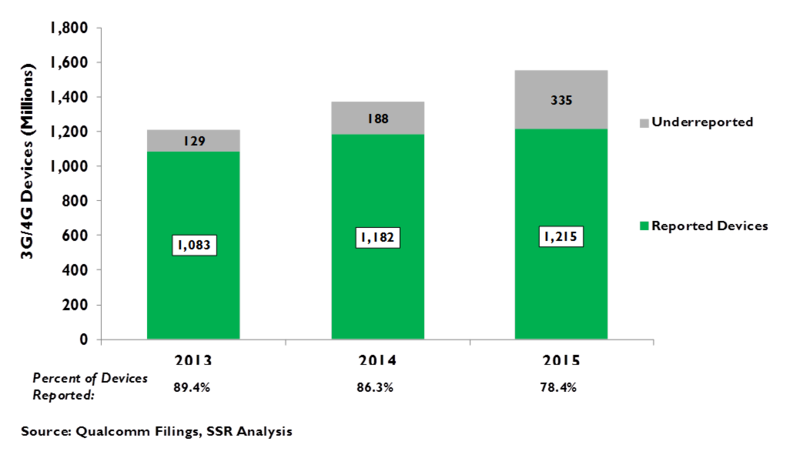 With cost cutting layered against growth in both royalty collections and chip sales, and an accelerated share buyback program, we see consensus expectations for 11% EPS growth in FY17 to $4.69 as too low by 15% or more. In that context, QCOM’s forward multiple, 13x the pessimistic consensus, is just 11x our more optimistic view. With a 15.5x multiple against FY17 earnings of $5.25, QCOM would be worth more than $80 and with a 17.5x market multiple, more than $90. The bad news for QCOM began at the end of 2013, when Chinese antitrust authorities announced an official probe of the company’s patent licensing activities in the country. This brought royalty negotiations with the new breed of indigenous brands to a standstill, and emboldened many existing licensees to deliberately underreport their sales and withhold payments, knowing that QCOM would be powerless to enforce their agreements. China was the hottest growth market in wireless, and the homegrown players were leading the charge but not paying Qualcomm. By 1QFY16, royalty revenues were off 12% YoY. At some point, likely a few months later in 2014, QCOM’s own R&D group dropped another bombshell on management – ARMH, the standards bearer for all smartphone processors, was moving to a 64bit processing architecture, but QCOM’s internally developed version would not be ready in time for the next generation of chipsets. To that point, its flagship Snapdragon SoC had been extending its performance lead over commercial alternatives, with only AAPL’s own proprietary implementation ahead of it. Now QCOM had to hurriedly transition to the same ARM reference design that most of its rivals used, wiping away much of its performance advantage. Samsung dropped the Snapdragon for its Galaxy 6 in favor of its own Exynos SoC. 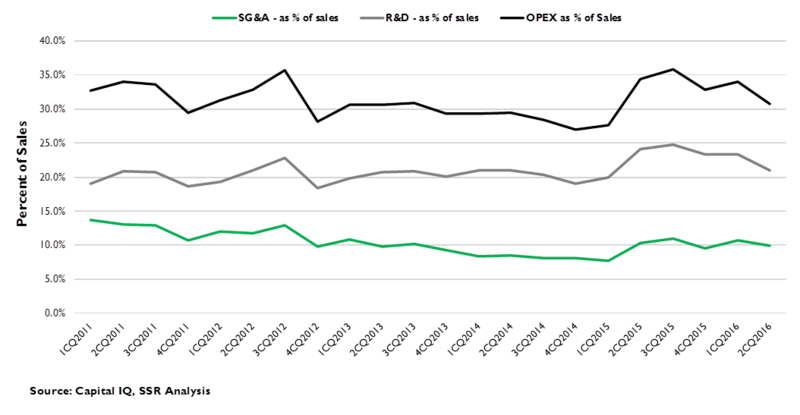 MediaTek ate away at QCOM’s market share from below, without a big performance gap to deter it. For CY15, Snapdragon’s share of smartphone SoCs plummeted from 52% to 42%. The road back has been hard. An agreement was struck with Chinese authorities in February 2015 establishing relatively favorable terms, but QCOM then had to hammer out resolutions with each of the Chinese OEM’s most of whom continued to withhold payment pending agreement. The new proprietary 64bit CPU design, dubbed Kyro, was ready for OEMs for their 2016 products, re-establishing QCOM’s performance leadership and winning back market share, notably with Samsung’s marquee Galaxy S7. Pressure from activist shareholder Jana Partners induced management to lay off 15% of the workforce and significantly scale back the generous employee stock compensation program. The hard work has now begun to show – both QCT and QTL revenues surprised to the upside in 3QFY16 and the company showed its first revenue growth since 2QFY15. Earnings surprised strongly, with the best operating margins since the Holiday quarter in 2014. Shares, which had fallen from $80 in July 2014 to $45 this past January, have rebounded to $60 (Exhibit 1-2). We believe QCOM will build on this recovery. Collections from formerly recalcitrant Chinese OEMs gives a near term tailwind, but we believe the global transition from 2G networks (where QCOM has no sales) to 3G and 4G (where it has significant opportunity) can drive growth for a few years. Meanwhile, we see QCOM as exceptionally well positioned for potentially huge markets in the Internet of Things, autonomous vehicles, hyperscale data centers, and others that we expect to develop in the next decade. The popular narrative that QCOM’s intellectual property will be less valuable to future generations has been badly overplayed given its leadership in seminal patents for 4G and dominance in 5G technical standards development. Given all of this, we see QCOM as cheap. 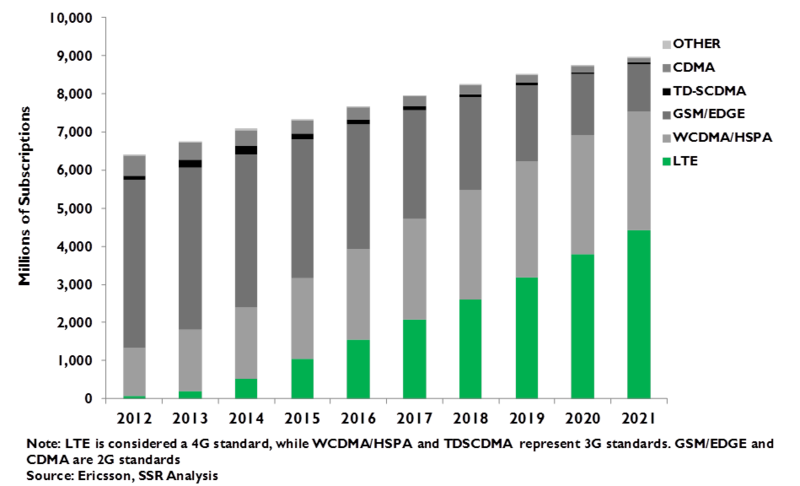 FY17 estimates appear 15%+ too low and its forward P/E against that pessimistic consensus is a well below market 13x. We see upside in QCOM shares to better than $80, or 15.5x the $5.25 in EPS that we believe the company can muster for FY17. The global smartphone market is reaching maturity. Almost half of the countries studied by Pew Research in 2015, including China, the US, Canada and most of Western Europe, top 50% penetration, with about 2 billion smartphones in use around the world. Even with 10% unit growth in 2015, most of it came at the lowest price points, driving average selling prices down and marking the premium tier as nearing saturation (Exhibit 3). We believe that the total value of smartphones sold world-wide will grow in the lower single digits annually through the end of the decade. There are currently about 4.7B mobile devices in the world. More than 45% of these devices operate on the GSM 2G standard that is not subject to Qualcomm’s intellectual property or addressable by Qualcomm’s semiconductor business, including almost all of India and over half of China. Over time, because of the substantially greater efficiency of the more modern standards, all 2G networks will give way to 3G/4G bringing the whole of the mobile market into Qualcomm’s purview. By 2019, Ericsson projects that the total number of mobile subscriptions will double to around 9B (N.B. many users will have more than one), with 7.5B operating on 3G/4G, and 5.6B of these being smartphones. Given obsolescence and replacement, we project that as many as 9B 3G/4G devices will be sold over the next 5 years and that the large majority of these will be smartphones (Exhibit 4-5). Prices will fall. We project high-end smartphone unit growth will be in the low single digits over the next 5 years (Exhibit 6-7). 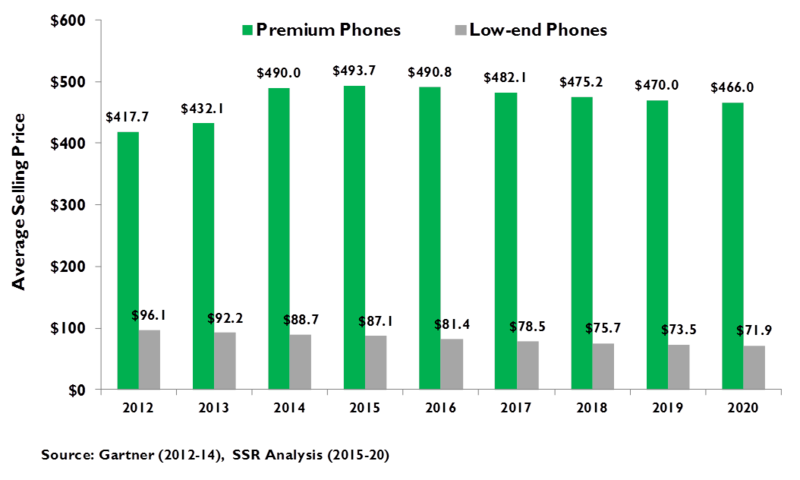 Low end models will grow at a robust 10-12%, with average prices for the segment edging ever lower as viable sub $50 products begin to drive demand. Collectively, this points to overall ASP’s dipping at a 4-5% CAGR, yielding market sales growth of less than 5% annually through 2020. Qualcomm aims to collect a royalty on every device sold with 3G and/or 4G connectivity embedded in it. Its claim to those royalties is well established over more than 20 years of legal challenges and negotiations with hundreds of device makers, almost every one of whom has bowed to the inevitable and signed a contract which obligates them to report their sales and pay royalties to Qualcomm. Most of these agreements offer blanket access to all of Qualcomm’s intellectual property, both patents that are “essential” to the 3G and 4G wireless standards and those that are “non-essential” but helpful in implementing standard compliant products. That distinction is important, as “essential” patents are required to be made available at “fair, reasonable and non-discriminatory” (FRAND) rates, while “non-essential” IPR can be licensed for any rate that the market will bear. While Qualcomm is the leader in patents that have been reported to the ETSI standards body as essential, it is the many thousands of non-essential patents that allow it to sustain its 3-4% royalties on mobile device sales. 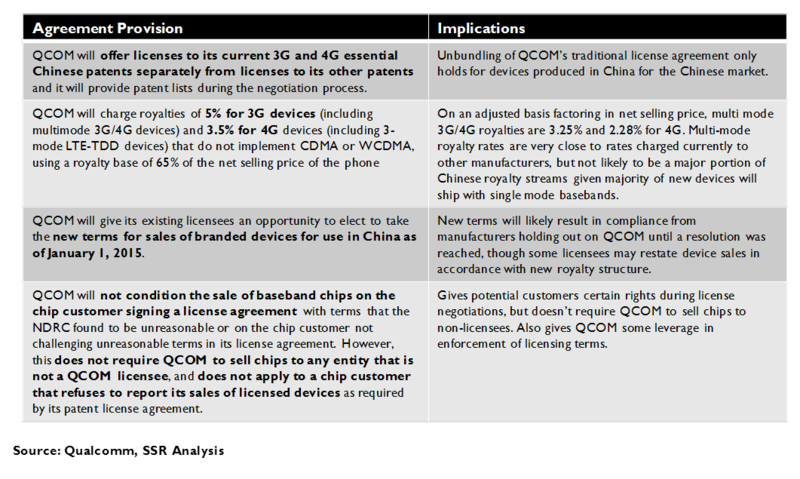 The agreement with Chinese regulators illustrate the strength of Qualcomm’s claims, confirming 5% royalties for multimode devices and a 3.5% rate for single mode 4G before forcing a 35% discount for sales of Chinese branded devices in China (Exhibit 8). In practice, these terms were similar to the agreements that Qualcomm had already reached with the biggest Chinese device vendors. Still, after signing the deal in February 2015, Qualcomm has labored to negotiate new license agreements with OEMs, facing substantial pushback on the collection of back royalties from prior periods. Qualcomm’s collection percentage, reflecting the royalties that QTL managed to collect vs. the total amount for which it was entitled, fell from 90% to 86% in 2014, and to 78% 2015 (Exhibit 9). Slowly management has struck deals and begun to collect, finally returning to growth in 3QFY16. Moreover, we believe that natural economies of scale will drive considerable consolidation in the still highly fragmented Chinese domestic market, with share concentrating in the hands of the large, internationally ambitious and license compliant large brands. All of this stands to take Qualcomm’s collection percentage much higher going forward, a serious boon to the revenue prospects for the extraordinarily lucrative QTL business unit. We project QTL’s revenues from smartphone patent licensing to grow at a relatively robust 6-7% CAGR through 2020. Qualcomm’s primacy in 3G, with its CDMA technical underpinnings, is well documented in the annals of wireless history. With the rise of 4G, with its shift from CDMA to OFDMA, many analysts project a significant decline in QTL’s royalty rates. The reality has not been quite so dire for Qualcomm. First, the overlapping nature of network deployment requires multi-mode devices for many, many years after the introduction of new network standards. More than 15 years after the introduction of 3G, 45% of the devices currently in use worldwide are still 2G only and the vast majority of 3G devices still support 2G standards as a fall back. The same will be true for 4G, which provides coverage to only a tiny fraction of the world’s landmass – expect multimode devices to be predominant for many, many years. Second, Qualcomm’s patent position for 4G is very strong. 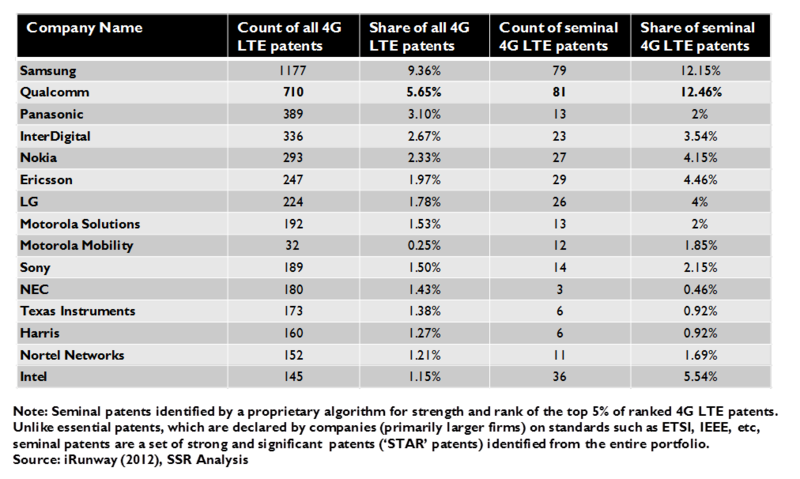 Qualcomm has the highest percentage share of the patents essential to the 4G LTE standard, with particular strength in those patents necessary for device makers. It also has thousands of other patents related to the workings of mobile devices in general and 4G devices specifically that are of enormous value to its licensees. Once again, the recently negotiated deal with Chinese regulators explicitly establishes the value of Qualcomm’s intellectual property to 4G single mode devices. Third, Qualcomm is the employer of choice for talented wireless engineers and invests far more in R&D than any of its would-be rivals. The strength of that effort is evident not just in the quantity of patents but in their quality. Of the 710 Qualcomm patents identified as essential to 4G by iRunway in a 2012 study, more than 11% were considered “seminal” – defined as ranking in the top 5% of all 4G patents judged on 22 parameters reflecting strength and importance (Exhibit 10). 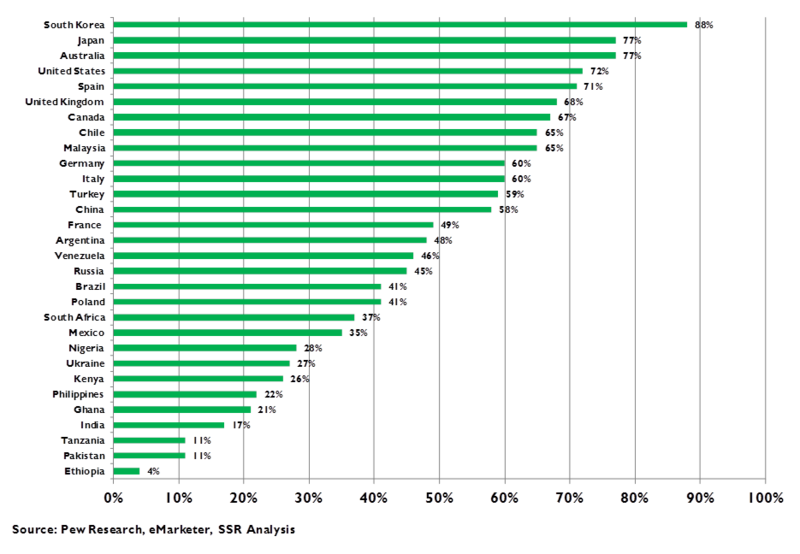 Altogether, Qualcomm was rated as holding 12.5% of all seminal patents pertaining to 4G. Qualcomm’s research advantage in 5G related technologies may prove to be even greater than it had been in 4G, when Nokia, Motorola, Nortel, Blackberry and others were still aggressive R&D rivals. Qualcomm’s QCT chip business had been on a roll. had been on a real roll. From 2012 to 2014, in the smartphone market, its Snapdragon SoCs had gone from 43% market share to 52%, driven by the advantages of its Krait CPU design and the strength of its integrated modems (Exhibit 11). Krait, although fully compliant with the detailed specifications provided by ARM Holdings with each annual release, differed considerably from the reference design available from ARM and used by all of Qualcomm’s rivals, save for Apple, which had its own proprietary design. Krait had a smaller footprint, used less power and supported higher clock speeds than the reference design giving it better performance while also leaving more room for implementing a leading edge modem on the same chip. However, 2014 brought a significant speed bump. ARM announced a new specification that bumped the core CPU from 32-bit processing to 64-bit processing. Qualcomm, usually quick to market with its proprietary riffs on new ARM specs, stumbled with the major architecture upgrade. The new proprietary CPU, code named Kyro, was not ready in time to be included in Snapdragon chips for the 2015 model year. Instead, Qualcomm hurriedly implemented the ARM reference design, not only giving up its accustomed performance advantages, but introducing a new disadvantage – the Snapdragon 810 had a tendency to run hot, raising the chance of failure and requiring OEMs to design more robust heat dissipation. Samsung dropped Qualcomm in favor of its own Exynos SoC for its Galaxy S6 flagship, and MediaTek began to erode Qualcomm’s dominance in premium Android smartphones from the lower end. Add in the booming success of the iPhone 6, and Qualcomm’s 52% share of smartphones fell to 42% in one year. The road back began with the introduction of the Snapdragon 820, complete with the Kyro CPU, available to OEM customers at the end of 2015. The 820 re-established Qualcomm’s dominance in merchant silicon for premium smartphones, winning back the Samsung Galaxy S7 flagship model and taking share with Chinese OEMs. The 820 delivered a 60% increase in computing performance on the widely used AnTuTu benchmark, leapfrogging not just Samsung’s own next iteration but Apple’s newest iPhone processor, the A9, as well (Exhibit 12). In the fall, Qualcomm is expected to release its newest SoC, the Snapdragon 823, to customers. This chip is designed for Samsung’s brand new 10nm LPP semiconductor manufacturing process, arguably the most advanced chip fab in the world. Early reports suggest a 2.2GHz clock speed, which alone would improve the chip’s performance by 18% vs. the 820. Considering the other design levers that Qualcomm could pull to enhance the speed, power draw and footprint of its chip, and the 823 could widen the gap vs. its rivals. Phones with the new SoC could be expected to hit global markets in early 2017. In April 2015, activist investor Jana Partners published an open letter to Qualcomm management, detailing potential steps that it believed could unlock value for shareholders. In July, management responded with its Strategic Realignment Plan – announcing job cuts of 4,500 employees (15% of the workforce) and a $300M reduction in annual stock based compensation, aiming for a $1.4B reduction in costs by FY17. To that end, OPEX as a percentage of sales was down 360bp YoY in 3QFY16, reflecting about half of the promised savings on an annualized basis. Operating margins in the quarter were 26.3%, a 510bp improvement YoY but still 450bp short of margins in 3QFY14 (Exhibit 13). We believe the impact of Qualcomm’s downsizing will have further benefit in the next 2 quarters and that renewed growth from the very high margin QTL business will also have positive effect on profitability. The plan also affirmed commitment to return at least 75% of free cash flow to shareholders through dividends and repurchases, raising its immediate buyback target from $10 to $15B to be completed by March 2016. 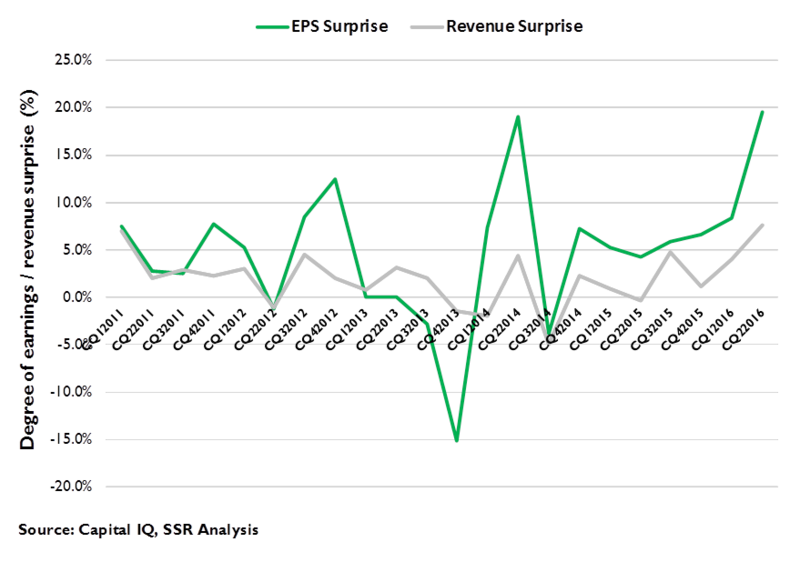 In 3QFY16, diluted shares were down 8.8% YoY, contributing to the 17% growth in non-GAAP GPS. Given the continued strong free cash flow generation and the prospects for sales growth and margin improvement, we expect Qualcomm’s share repurchase program to expand in coming years. While the transition of more than 2 billion GSM phone customers to 3G and 4G, albeit via very low cost devices, will drive reasonable growth for Qualcomm over the next few years, we also see significant longer term opportunity. First, QCT can expand the amount of semiconductor content that it addresses in each smartphone. It has already added RF components to its product line, and could conceivably integrate them into single package turnkey solutions down the line. It has added deep learning support to its flagship chipsets to accelerate AI development on smartphones that use its architecture. It also could address the growing number of sensors included in each device. Qualcomm’s processor and communications expertise also has great relevance to a number of emerging markets. It has begun testing its 24-CPU server chips with major hyperscale data center operators, like Google and Amazon, and expects to begin shipping commercial product in the second half of 2017. Qualcomm is also well positioned to attack the Internet of Things (IoT) market, once the industry gets past the standards battles that continue to keep IoT from gaining critical mass scale. Given these internecine conflicts, we see IoT as taking off sometime after 2020 but note that the potential is massive. Qualcomm will also benefit from carrier deployment of 5G, which will shift the emphasis of radio access networks toward a proliferation of “small cells” rather than the wide area macro cells that dominate 3G and 4G networks. These small cells will center on a SoC modem processor combination, much more like a premium smartphone than a much more customized macro-cell. This is a perfect match for Qualcomm. With the significant problems – poor royalty collections in China and share loss for premium smartphone SoCs – showing clear evidence of resolution in the 3QFY16 results, we believe Qualcomm can generate mid-to-upper single digit sales growth for FY2017 and beyond. 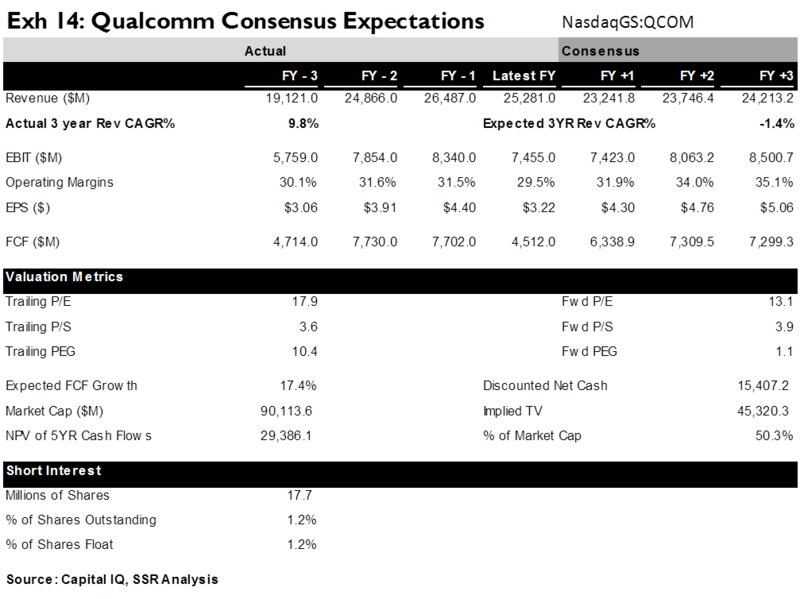 Current consensus, before likely revisions, reflects just 2.5% growth. Obviously, we believe the company will do much better. Layering in further cost cutting, along with the accelerated share buyback schedule, we believe expectations for just 11% EPS growth in FY17 to $4.76. We believe that actual earnings could beat that target by 15% or more. Qualcomm’s forward earnings multiple, 13 times the pessimistic consensus, is just 11 times our more optimistic view. With a strong likelihood of significant upward revisions and future earnings upside, we believe the stock is likely to rerate upward to reflect a more buoyant narrative. Using a 15.5 times multiple against FY17 earnings of $5.25, would suggest a price of better than $80, while a market multiple of 17.5 times would suggest more than $90. This leaves plenty of room for Qualcomm to disappoint against our bullish scenario yet still show considerable upside vs. current street estimates and the $60 share price.